Inshore water temperatures in Little River had been in the mid to lower-70s, but over the weekend they dropped into the 70-degree range – and even slightly cooler. With warm weather they will rebound quickly. 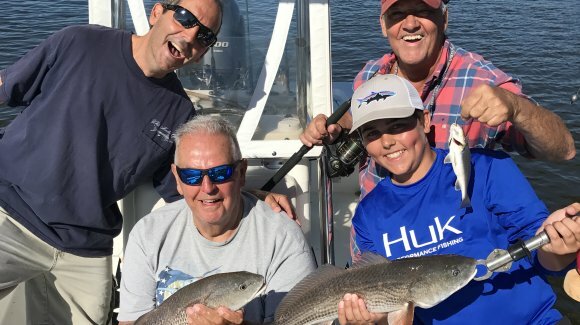 Inshore fishing continues to be good in the Little River area, and Captain Patrick “Smiley” Kelly (843-361-7445) that most of the inshore species are feeding pretty well right now. Even with the high winds redfish have been available, with 15-22 inches the average catch size. Fish have been biting best on falling tides, and they have been around docks and oyster beds. Live mud minnows and Gulp! baits fished on a ¼ ounce jighead have been working best. Black drum have been found in the same areas and on the same tides as the red drum, but shrimp have been working best for them. More and more bait stealers like pinfish show up each week so keeping a shrimp in the water until a drum finds it is getting harder and harder. Trout have been found in slightly deeper water in the 6-10 foot range around ledges and oyster bars, with the low to rising tide most productive. Mud minnows or Vudu Shrimp fished under a popping cork have worked well, as has just jigging one of the imitation shrimp without a cork. 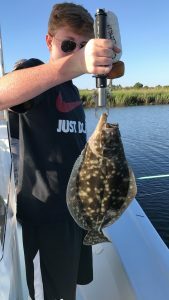 In the Tubbs Inlet-area lots of short flounder in the 12-15 inch range have been caught, while in Cherry Grove plenty of keepers are being landed. Guides report catching fish up to about 6 pounds in the area. Cherry Grove Pier (843-249-1625) reports that on the bottom whiting, croaker and perch are around, and there have also been bluefish and Spanish mackerel. Yesterday they had a nice run of Spanish with some fish undersized, the biggest up to 22 inches, and a good number of 14-16 inch fish. There have been no kings in the last week but four so far this year, with those coming in mid-April.